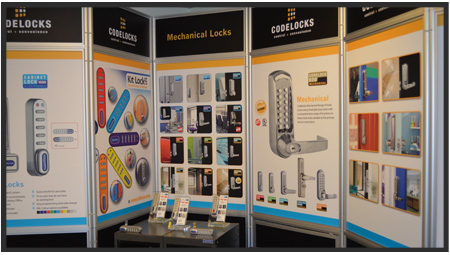 The Locksmiths’ Exhibition is taking place at the East Midlands Conference Centre, Nottingham on 2nd and 3rd March. Around 60 exhibitors will showcase their products and services to over 1000 visitors expected to attend over the weekend. We are exhibiting in the Concourse, and you will find us on stand C15. We’ll be bringing our whole range of mechanical and electronic push-button door locks with us for you to come and tinker with, and our lock experts will be on-hand to answer all your questions. Just in case you need another reason to visit our stand, we’ll also be running a prize draw where you can win a ‘spares kit’ like this worth £75 simply by leaving us your business card or contact details. Our training workshops will be running twice on Saturday (from 10:30 to 12:30, and from 14:30 to 16:30), and once on Sunday (10:30 to 12:30). The workshops will provide practical support and advice for locksmiths on how to find new business, as well as a hands-on session, where we will show you how to install, programme and operate our coded locks. We will end the workshop with a Q&A session to make sure you’re questions don’t go unanswered! You will also be given a certificate for the training received. The workshops cost just £5 to attend and you can book onto them here. So, if you are at the exhibition this weekend come and visit Nigel, Roy, Dominic and James on our stand for a chat! For more details or if you have any questions visit us on stand C15 or contact us on 01635 239645.